Police officers are expected to enforce distracted driving laws — but how often are officers distracted? Incident reports from across Minnesota show dozens of crashes in the last four years involving police officers distracted behind the wheel. While those numbers are small compared to the 17,000-plus distracted driving crashes each year in Minnesota, there's growing concern the technology packed into squad cars is creating its own hazard. "Every gadget that we're stuffing in the car puts demands on the human being that human beings can't do," said Bryan Vila, a former Los Angeles County deputy who's now a professor at Washington State University in Spokane working on a first-of-its-kind national study on distracted police officers. After examining hundreds of crash reports since 2010 and reviewing several hours of police squad car videos, MPR News and KARE 11 found 61 crashes in four years where crash investigators said distracted driving by the officer was a factor. More than half the time, the officer was distracted by something inside the squad car, such as a cell phone or computer. Outside distractions — officers taking their eyes off the road to do their job, identifying a driver not wearing a seatbelt or looking at a suspect vehicle — were noted in many other crashes. The average police officer drives thousands of miles more than the average driver and the number of crashes involving distracted police officers is still relatively low. Still, cops acknowledge the tech wedged into the front seat is making safety harder. Imagine juggling radios, phones, squad computers that give officers important information and fast communication with dispatchers, all while trying to patrol the streets, looking out for suspicious activity or someone who needs help. The modern police vehicle is a "mobile office," said Brooklyn Park Deputy Police Chief Mark Bruley. His officers are trained to not take their eyes off the road for more than two seconds at a time. His department has also moved up the squad computer's position in the front console of police vehicles and set it closer to eye level to help officers keep their eyes up and on the road. Brooklyn Park also requires officers to go through defensive driving training where officers are tested on their ability to deal with distractions and when two officers are in the squad car together, one drives while the other operates the technology. The department, however, doesn't ban officers from using cell phones or computers while driving. "We know that if we restrict it too much then it's going to affect their ability to perform their jobs," Bruley said. "We're trying to find that balance where we can have both." MPR News and KARE 11 found that while most large metro law enforcement agencies surveyed have policies that address distracted driving, none bans the use of cell phones or computers while the vehicle is in motion. Officers have to drive with due care like everyone else, but when they are performing official duties, they are exempt from the state law that prohibits emailing, accessing the Internet and texting while driving. Brooklyn Park and other departments encourage officers to pull over or at least wait to look at the phone or computer until they're on a quiet road. Most agencies say officers should not send or review lengthy messages while the vehicle is in motion. While rare, the consequence of distracted driving by police can be heartbreaking. In 2012, at a busy Maple Grove intersection — Elm Creek Blvd. and County Rd. 81 — Jaime Grittner collided with a Maple Grove police officer who ran a red light. Grittner had the green light and the right-of-way, but not enough time to stop when Officer Dominic Wareham drove through the red light. Her car slammed into his squad car. The dental hygienist from Rogers, mother of two small children, suffered several injuries in the crash including a broken sternum. Wareham was also injured and treated for non-life threatening injuries. Wareham was not on an emergency call at the time of the crash according to data that accompanied the squad video. Neither his emergency lights nor siren were activated. A department memorandum describes how Wareham "thought he was facing a green light but when he looked up from his (mobile data computer) he saw that the light ... was red." 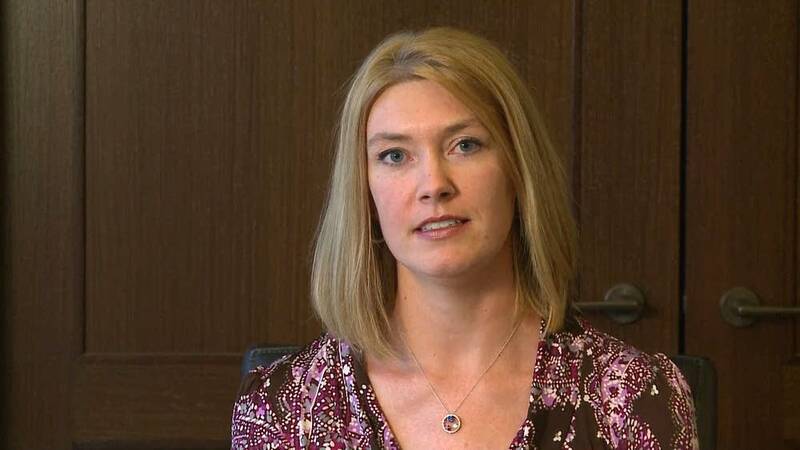 Grittner is suing the city of Maple Grove and Wareham for damages to cover her medical expenses. 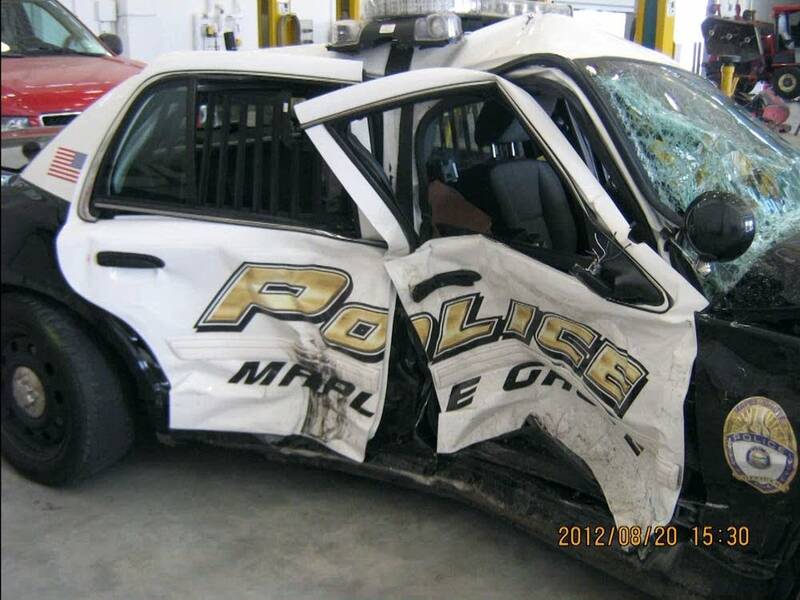 The Maple Grove police department declined comment, citing the litigation. "My life flashed in front of me. Just that feeling of is this really happening? Is this really what's going on and is this really a police car that's, you know, right in front of me and just feeling powerless, completely powerless as I put my foot on the brake and held on for dear life," Grittner said. "They're supposed to be the role models," she said of officers who are distracted. At Washington State University, Vila has been putting dozens of officers through hours of testing. 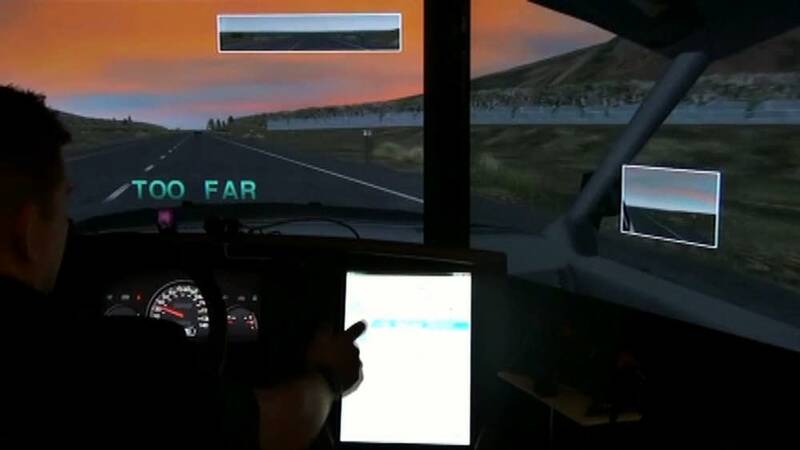 Using a computer-simulated squad car, the officers have to drive at 55 miles per hour, stay in their own lane and remain no more than 100 feet from the car in front of them — a car that randomly slams on its brakes. "What we're trying to do is both identify what impairs police officers or interferes with their optimal performance and how much the risk of a problem is," Vila said. The simulation also includes distractions, like a simple reading task or using the squad computer. Vila said preliminary results show even distractions far less demanding than police vehicle equipment increase the risk of an officer getting into a crash by more than double. The simulation also accounts for officer fatigue. "When you combine the effect of fatigue and the effect of distraction we have a very strong interaction," Vila said. In an intriguing twist, new technology may help cut down on distractions in the squad car. The Hennepin County Sheriff's office, for example, has 77 squad cars outfitted with software that detects when the car is moving and locks the keyboard when the vehicle accelerates over 15 miles per hour. Some agencies, like the Minnesota State Patrol, have automatic license plate readers, although a recent Minnesota Police Chief's Association survey found only 15 percent of police departments in the state use the technology. Greater awareness and understanding of the impact of officer distractions may also help cut the number of crashes, Vila added. "You can teach them how dangerous it is, so minimize it," he said. "If you're going to do something that's distracting then think through what you have to do, where you are. Is it safe right now?"